A few days ago I learned about Google Alerts from Savvy Blogging. I immediately set up a few alerts using different variations of my blogging name. The benefit is that I’ve found mentions of the blog or a post that for some reason WordPress didn’t find allowing me an opportunity to comment and thank the author. For the most part the content of the messages have been expected. But not this one. 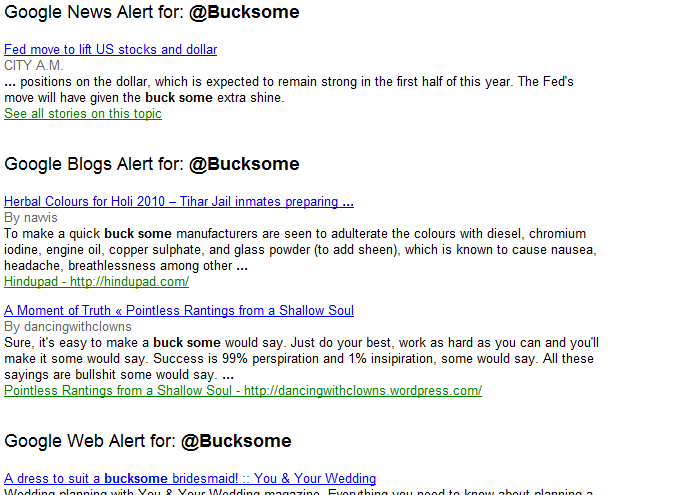 I hit the jackpot with results for the categories of news, blogs and web with five results. Of course, none of them were related to me. Let’s take a look at the results for “Bucksome”. This entry does have to do with finance so it’s pretty tame. It’s a news story about the Fed’s recent move to charge banks more for emergency loans and that it will result in making the dollar more attractive by giving the “buck some extra shine”. There are two results this day for blogs. @ Hindupadwrites about jail inmates making organic dry colors and how other manufacturers in order to “make a quick buck some” add toxic ingredients. Due to my ignorance, I can’t figure out what they do with the colors but it sounds like a positive project for the inmates and the consumers. The second result is from a new blog with a interesting name, Pointless Rantings from a Shallow Soul. I don’t get the point (hence the blog title) but apparently “it’s easy to make a buck some would say”. Sociological Imagesdiscusses several ads attempting to show how their products make the man even more manly. A commenter includes the magic words in the context that one of the ads may be attempting to “buck some of the stereotypes”. Checking out the articles in this alert has taught me two things. One is that none of them were as interesting as they looked and therefore I wasted my time (and yours). Second is that I need to edit my alert with quotes so I only get bucksome. If you haven’t already set up any alerts, give it a try. You might find something fun. thank you so much for stopping by my blog and leaving a comment! I love google alerts, but its almost always unrelated or interpretations of what I wanted. Even if you put it in quotes… but sometimes its really useful, and occasionally a funny surprise, like what you found! .-= elizabethÂ´s last blog ..Saucy Secrets! =-. It seems I was the last one to learn about Google Alerts. Glad to hear that my experience is not unique. I enjoyed your blog and look forward to reading more in the future. Hahaha! Thanks for the info. .-= Random Thoughts of a Jersey MomÂ´s last blog ..My $50 Wedding =-. Thanks for stopping by, Jersey Mom. I see you have plans for a 15 year anniversary vow renewal. Mr. Boomer and I are celebrating 15 years in May. Vow renewal is a great idea, but I’ll wait until 20 years because that’s when we’ll have no mortgage or any other debt. I find Google alerts very useful. I’ve maintains alerts on both my name and the name of a key client of mine for whom I do freelance writing. I have a lot of online material from past jobs, and it’s nice to track where it’s popping up. A lot of those news aggregation sites pick up my stories from my previous job. The alert i have set up for my client company’s name is helpful to help me track where the press releases I write are published. I don’t always have time to visit all the websites where I submit the PR and so the Google alert does my job for me. Fern, I”m finding it useful the same way. Sometimes Wordpress doesn’t find when I’ve been included in a carnival, but Google Alerts lets me know. Next post: Is a Phased Retirement for You?